I turned 32 a couple weeks ago, which means I was on the hunt, as I am every year, for the perfect book to read on my birthday. Last year I went with The Unseen World by Liz Moore, which was an absolutely fabulous feat of literary fiction and set the bar really high. This year, though, my reading tastes have taken a hard left into genre territory, and I wanted to find a book that embodied my newfound love. 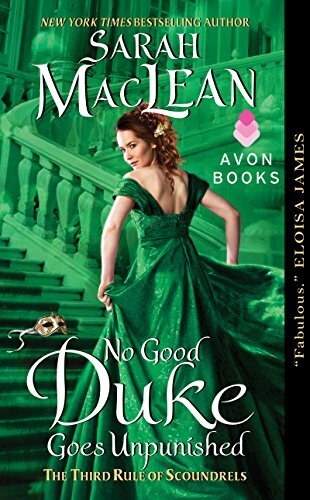 Rather than risking my birthday bliss on an unknown quantity, I went with the odds and picked a book from a series I already know I love: No Good Duke Goes Unpunished by Sarah MacLean. Sometimes the safe choice proves best, because I spent a lovely afternoon exploring the Killer Duke’s dark past with a cat on my lap. Our former cat friend, Murphy, passed away a few months ago, after nearly 20 years of napping and randomly, inexplicably caterwauling. We still mourn his loss, but we are not the type of people who can be cat-less for long. Over the weekend, Adam agreed to take me to the Humane Society to pick out a new cat or cats. I was so excited because I’ve wanted a cat of my own since I was a kid, and this was the first time I ever got to pick one out myself. The realization of a childhood dream! I’ve never been around a young, spry cat before, and Cheeto is definitely that with an extra dash of ornery on the side. I’m no longer surprised when a paw shoots out from under the bed and attacks my foot as I walk by. Prunella is more mature (some might say grouchy, but I’ll go with mature), and while she loves humans, she entirely resents the existence of both Cheeto and Cooper (our dog) and makes whiny-growly noises anytime either of them enters her sight, although we think the radius of anger is slowly reducing over time. Eventually, we’ll all be one happy family. In any case, Prunie has already proven herself to be a top-notch reading cat. By now you’ve probably realized I have pulled a bait and switch, luring you in with the promise of a romance novel and instead giving you unsolicited photos of my cats. So in the interest of fairness, here’s a little bit about No Good Duke Goes Unpunished and why you should read it! Sarah MacLean is the ultimate in writing strong female characters. Mara Lowe faked her own death—it doesn’t get more badass than that. Years later she’s coming back to society to clear the name of the man she framed for her murder, the buff and brawny Temple, who now makes his living as a bare-knuckle boxer. This series (The Rules of Scoundrels) has a little something for everyone. Each book features a different couple, and there are striking differences in the courtship of each one. It was fun to read this story about super-manly, larger than life Temple and contrast it with the last book, which was about (and I say this lovingly) skinny nerd Cross and his equally cerebral lady love Pippa. I highly recommend Sarah MacLean, even if it’s not your birthday. Two paws up!